All the major players participating in Saturday’s “UFC 158: St-Pierre vs. Diaz” extravaganza will be hitting the podium today inside Bell Centre in Montreal, Canada. Stream Thursday’s pre-fight press conference live right here on 5thRound.com starting at 1PM ET/10AM PT. In addition to UFC President Dana White (Pictured), Georges St-Pierre, Nick Diaz, Carlos Condit, Johny Hendricks, Jake Ellenberger and Nate Marquardt are expected to attend the presser. 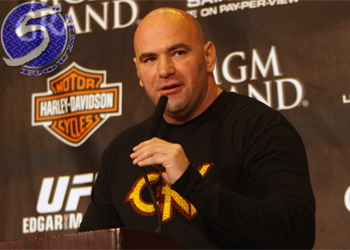 St-Pierre defends his welterweight throne against Diaz in Saturday night’s featured attraction.